City living can be a lot of fun, if you’re okay with small spaces. That’s one reason why our designer from New York, Alex Gaston, loves this loft. While our galley kitchen may seem small to you, to Alex it’s huge. It’s all about your perspective. 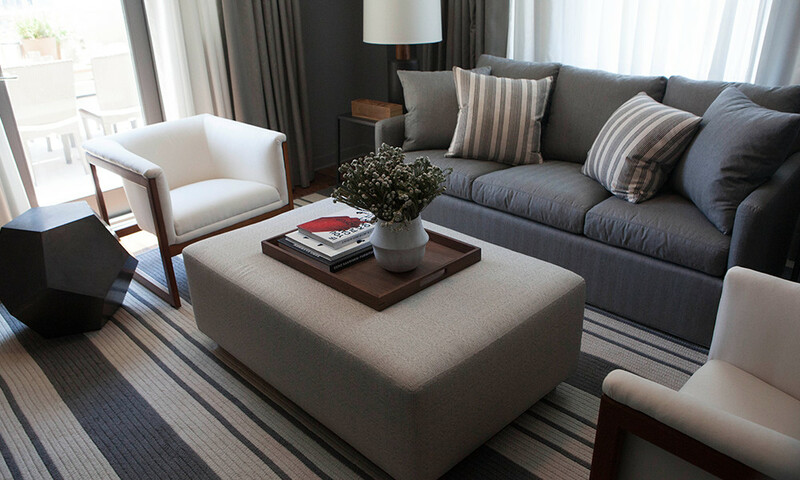 One way to make any space feel larger is to consider more than your immediate surroundings in the design. In our loft, Alex is considering how the inside and outside come together in terms of design and function. If you successfully complement what’s outside, which is expansive, with what’s inside, then you give the illusion of more space. Use a non-barrier, like sheers, on the windows, so there is a feeling of connection with the outside space. This results in a design that doesn’t compete against itself. Use a similar material across the two spaces such as a certain type of wood or fabric. Marry the function of indoor and outdoor spaces. For example, our downstairs patio will connect with the main living room and be used for entertaining, while the upstairs patio will be an extension of the private master bedroom oasis. Utilize colors and textures that tie adjoining spaces together. Remember, focusing a room toward the outside makes it feel larger and creates a seamless transition. Sharing elements such as fabrics, woods or accessories across spaces makes the design feel more consistent or as Alex likes to say, more considered. In a future episode of Perspective Atlanta you will see Alex’s full philosophy on melding inside and out come to life. In the meantime, share with us how you’ve brought your indoor and outdoor living spaces together via Instagram @Sunbrella #perspectiveATL.